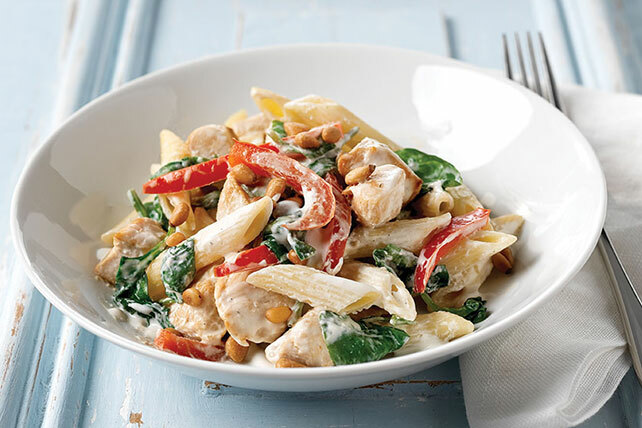 Get a classic right off a restaurant menu with our Creamy Chicken Florentine recipe! Fresh spinach and garlic make this chicken Florentine recipe so tasty. Mix cream cheese spread, milk and garlic powder until blended. Cook and stir chicken and peppers in large nonstick skillet on medium heat 6 to 8 min. or until chicken is done. Add cream cheese mixture; cook and stir 3 min. or until heated through. Remove from heat. Substitute PLANTERS Slivered Almonds for the pine nuts. Substitute uncooked deveined peeled medium shrimp for the chicken; cook and stir with peppers 2 to 3 min. or until shrimp turn pink. Add cream cheese mixture; continue as directed.